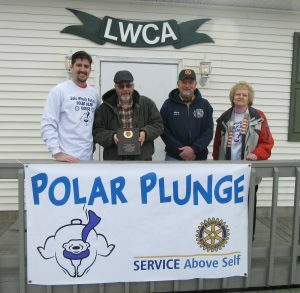 Winola Rotary president Dale Baumes (above, left) and Rotary secretary Gail Rees (right) accept a plaque from Lake Winola Fire Company president Dave McGovern (second from left) and fire chief Marty Bonifanti in appreciation for bringing the community together for a third successful Polar Plunge. 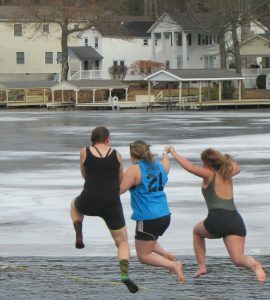 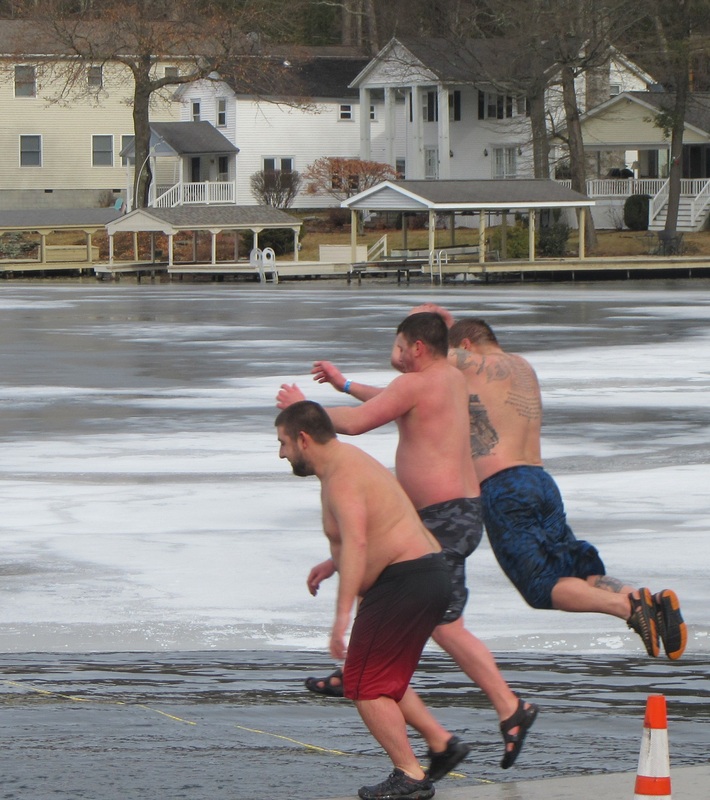 For a third year, the Lake Winola Rotary drew a large number of winter thrill seekers and spectators to their annual Polar Plunge, this year benefiting the Miles for Michael Fund of the Luzerne Foundation. 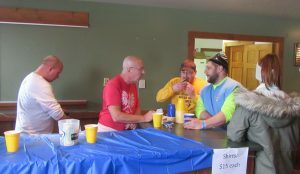 Approximately 40 jumpers paid $35 each to participate. Entry fees, plus other donations help the Rotary raise a couple thousand dollars per year, according to four-year Rotary president Dale Baumes. 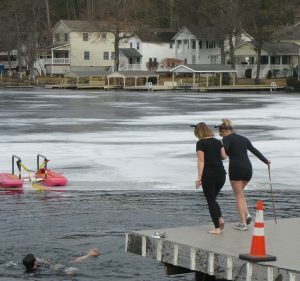 Some “plungers” wore costumes. Some jumped in separately, and others took the leap in groups. 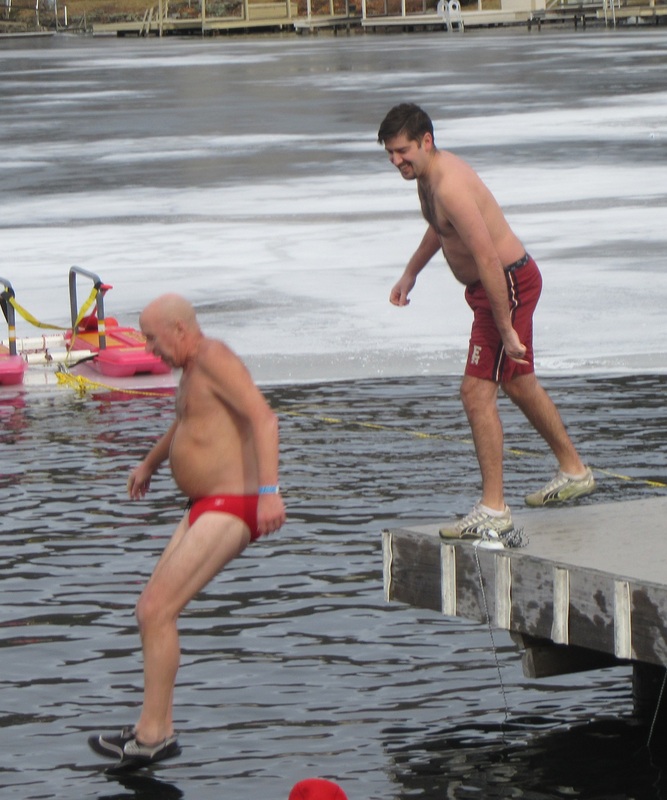 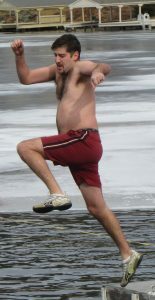 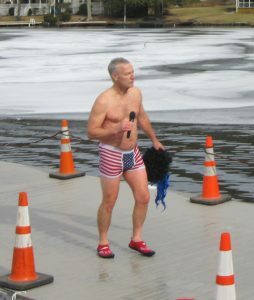 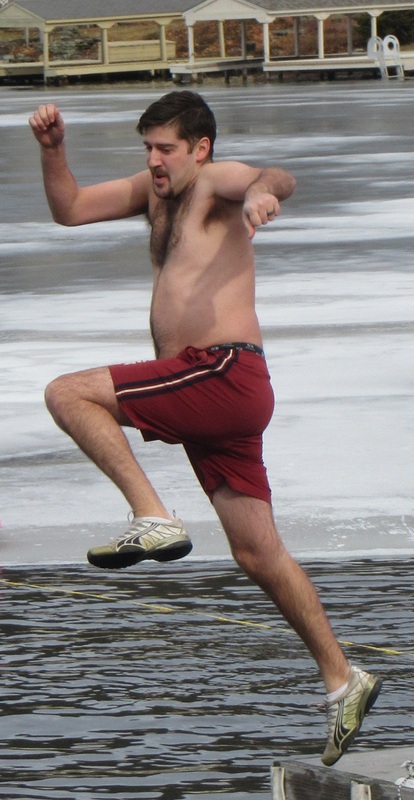 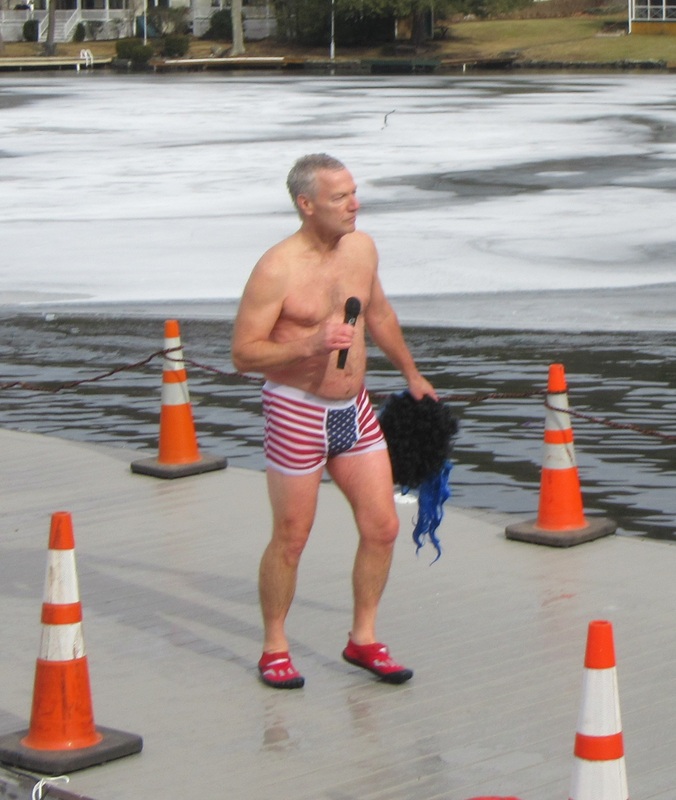 This year’s Polar Plunge King, Pete Evenofski of Wilkes-Barre, got a little help from Baumes, who then followed the red-Speedo-clad man into the icy waters of Lake Winola. 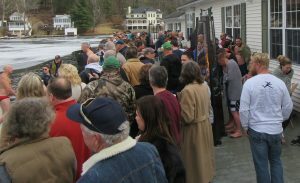 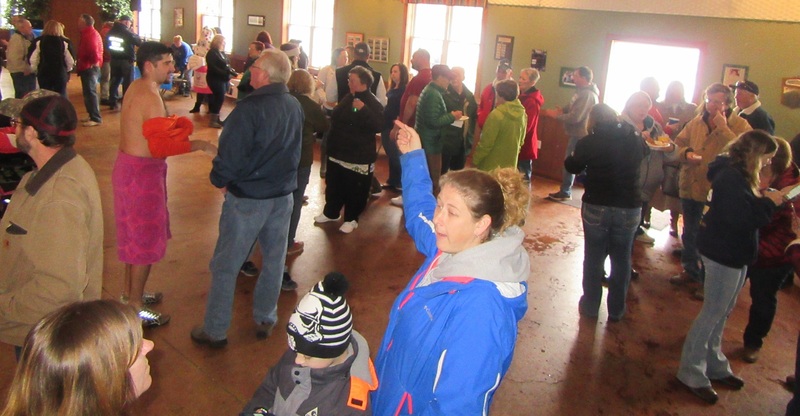 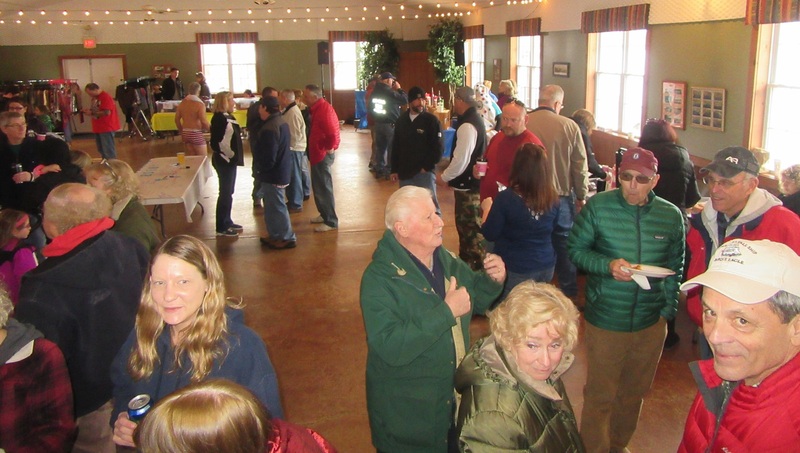 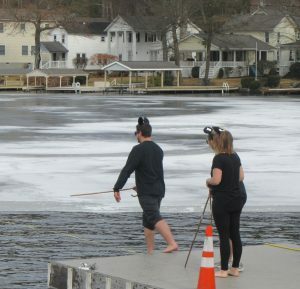 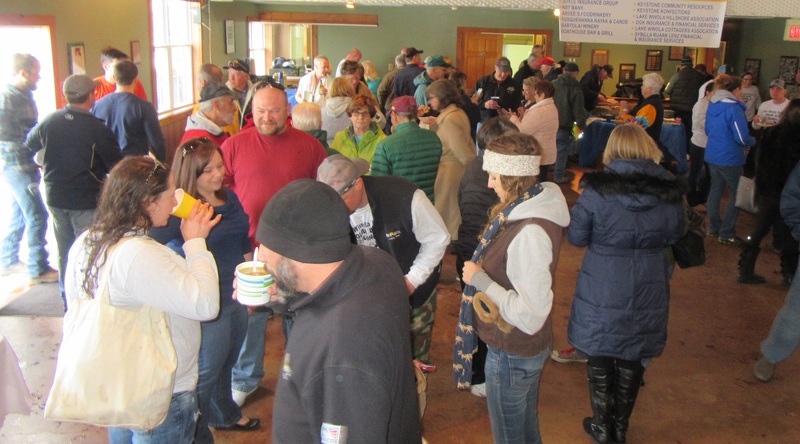 The event was moved this year to the Lake Winola Cottagers Association club house, which provided ample space for warming up before and after the plunge and for enjoying largely complimentary beverages and food. 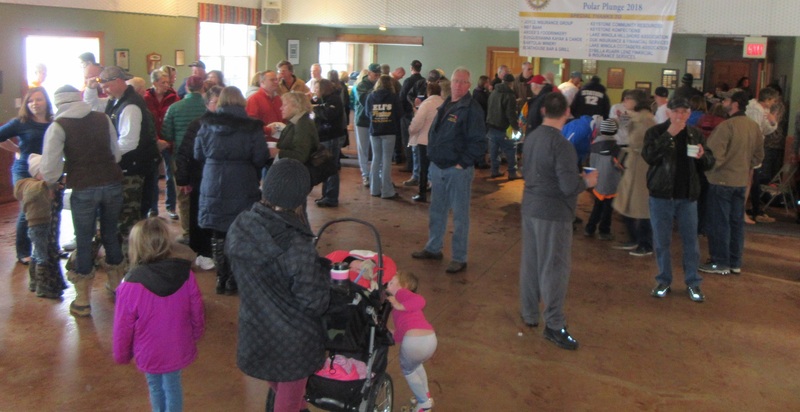 Rotary members canvas the community and businesses prior to the event each year for donations to cover the cost of pulled pork, beef barbecue, and other hardy snacks, as well as coffee, hot chocolate and cold beer. Lake Winola Fire Company chief Marty Bonifanti and president Dave McGovern agree and presented the Rotary with a plaque to commemorate the event. 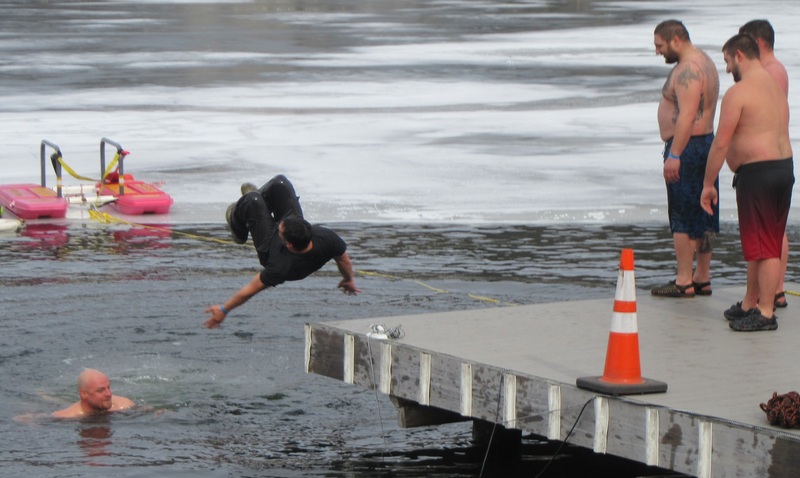 The Polar Plunge provides an excellent opportunity for the company’s cold water rescue team to practice maneuvers prior to the festivities, and team members are in the water at-the-ready as the plungers take their turns going off the end of the dock. 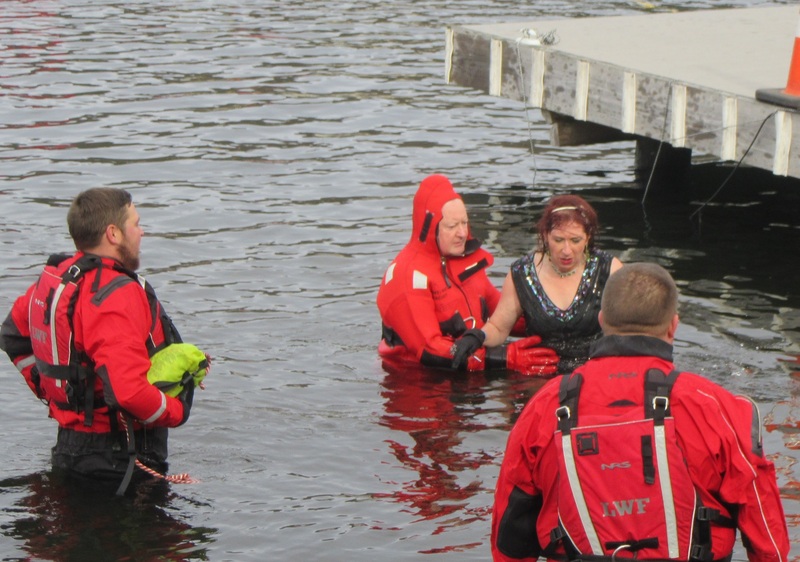 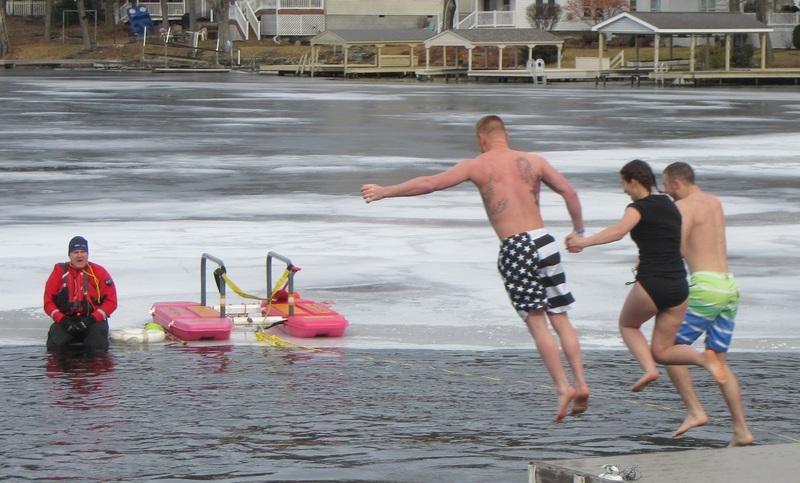 Icy water is quite a shock to the system, especially for first time jumpers, and fire company members did help a few distressed participants to shallow water when the looks on their faces made it apparent that the cold was more than they had expected. Numerous plungers took a second jump, making it look easy to spectators who lined the back deck of the club house. 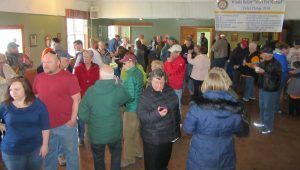 Inside, guests could also purchase T-shirts and make donations to assist the Rotary with their cause as Baumes’ father, Kevin, emceed the party and played music. 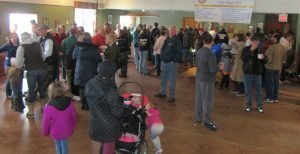 For more information about the organization, interested readers can follow Winola Rotary Club on Facebook. 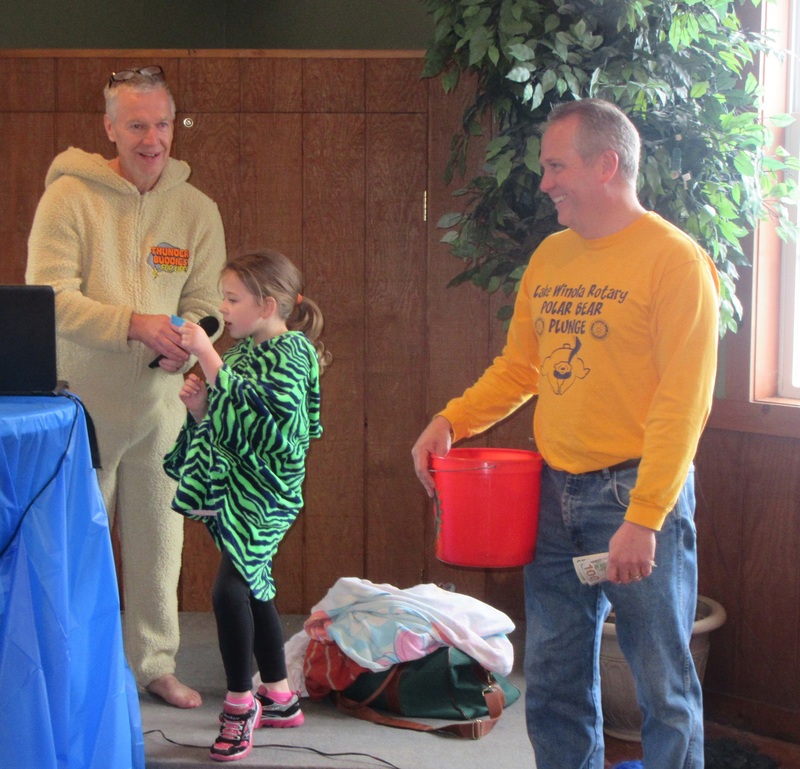 As Art Coolbaugh of Falls looks on, Selina Gallagher of Taylor reads the numbers on the the winning ticket for the 50/50 drawing with DJ Kevin Baumes. Erica and Erin (not pictured) of Lake Winola netted more than $200 from the contest. 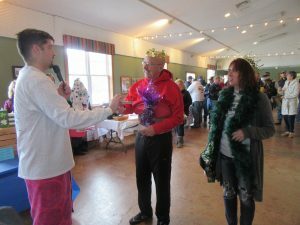 Winola Rotary president Dale Baumes (left) presents Polar Plunge King Pete Evanofski and Queen Meredith Miner-Reese with their prizes. 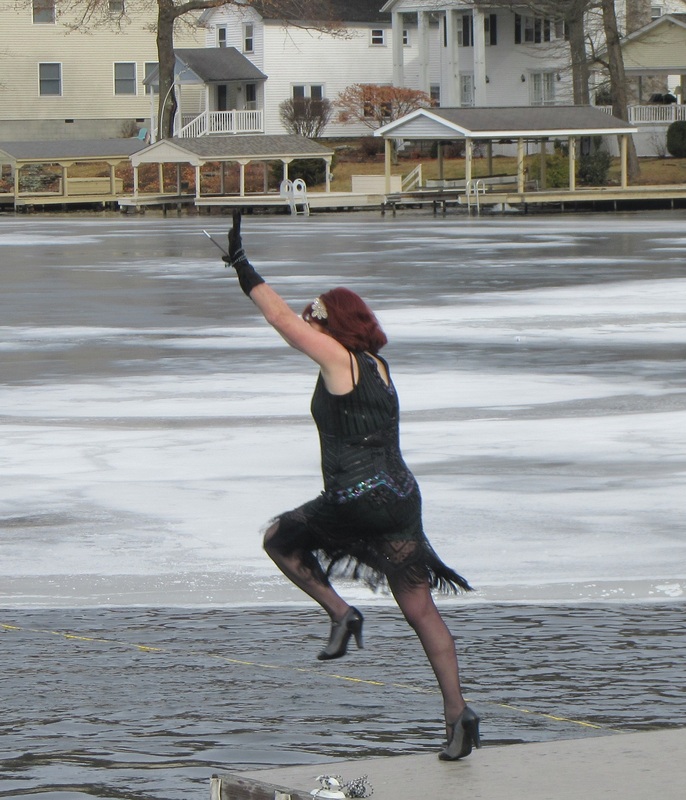 The two celebrated by posing outside, facing Lake Winola.